She has generously shared her tutorials the past two weeks and I would love you to learn all about her, her family and her sweet shop. "Hi everyone! It is so good to "officially" meet! Painting, scrapbooking and crocheting in my spare time were about the extent of my crafiness, until I had my daughter. She introduced me to the wonderful world of mommyhood, spit up and my inner girly girl. Mackenzie was a huge spitter upper since the day she was born. It seemed like there was always something (be it drool, spit up or cute baby noises) coming out of her mouth. Because of this she was never without a bib and my husband and I were never without a burp cloth. I had the hardest time finding cute bibs to go with her outfits and trendy (and absorbent) burp cloths to go with mine so I decided to take matters into my own hands and make some myself (my first time ever touching a sewing machine!!). 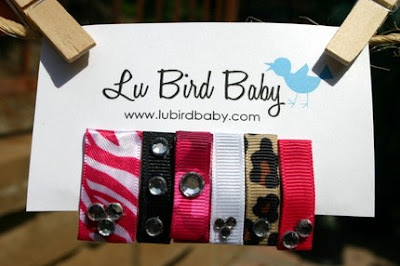 From the bibs and burp cloths I moved on to baby headbands (because I have a weakness for bows, ruffles and all things girly) and my business "Lu Bird Baby" was born. As Mackenzie grows, so does my creativity. She constantly gives me new ideas for fun girly things to make and once Wesley is here I am sure I will be making more "manly" things as well, so stay tuned!" Is this just the best breakfast you ever did see? Now a two year old could bring you breakfast in bed! A baby doll changing set. My girls would spend hours taking care of their dollies. Your little man can now roll in style. If Janey ever grows hair, this set is so me it's crazy! What more could a girl ask for to organize her hair candy on? she just joined today and who doesn't love friends to tweet with? 4. Leave a comment with the BEST baby advice you have ever been given. 5. Leave a comment with the WORST baby advice you have been given. I look forward to a few laughs. A winner will be chosen on Friday July 24th. 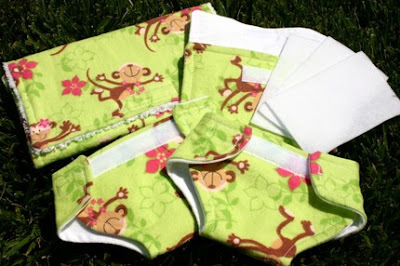 I am so in love with the diaper set- I will be ordering a set for my little one!! Also, the bacon and eggs is too cute! 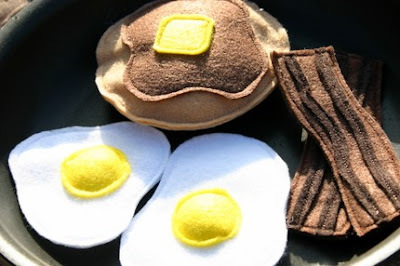 love the felt breakfast - so cute! the best baby advice that I've ever been given is to NOT listen to anyone's advice that you are not seeking! the worst one is to start feeding them solids at 2 months so they'll sleep longer. seriously! My favorite thing is the felt breakfast, my daughter would think that's pretty great. he necktie onesies are so sweet too! The best advice I ever got was to probably relax, not worry if the house wasn't clean and enjoy every minute! 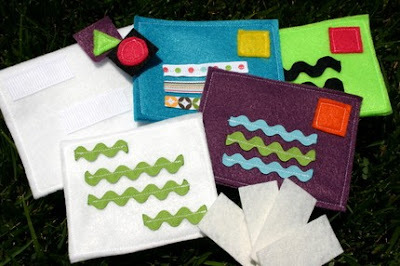 My boys would LOVE the felt mail set. My 4yo has been asking for his own "mail station". I love her felt food & mail sets, but the diaper sets are cute too I just don't know if my girl would use them, she doesn't really play with her dolls/stuffed animals much. I started following on twitter. I found her blog durring the May Giveaway day (I think) and have been following it since. I love Kristen's style and the fun stuff she comes up with! Oh my goodness! What's not to love! I think my favorites are the felt food items and the doll diaper sets...my daughter would love these! 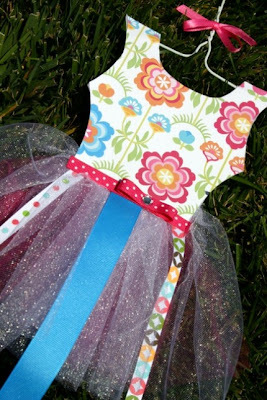 I love the hot pink tutu bow holder...i have lots of bows that would look great on that!!! Wow--so hard to choose. The felt food is cool, but the dress0up capes would be a hit at my house. Best advice--your kids will react to accidents (falling, getting hurt, etc) based on your reaction. Act like things are no big deal and they'll get up and shake it off. worst advice--basing potty training on an age rather than on the signs that your child is ready. I love the felt mail the best! Every day my daughter goes with me to the mail box, and any of the junk mail we receive becomes her "special mail!" Love the felt food! My little guy would, too! Best advice I got-do what you're comfortable with. Stupidest advice I ever got-(at 2 weeks old) "Don't pick him up right away...you're going to spoil him!" Still annoys me to think about that! I love the felt mail set! My son would LURVE the felt breakfast set. It is darling! I left her a comment. I love those doll diapers!!! I left her a comment! The best baby advice I got was from a friend I taught with and she told me to rock my babies, because they grow up too soon and they won't let you do it anymore. The worst I ever got was from the nurses at the hospital with my first baby and they told me that I needed to wake up my perfectly plump and healthy baby every 2-3 hours to eat if he was sleeping. PLEASE! The Green Dot Necktie Shirt (18 months) is just adorable, thanks for the giveaway and have a great day! ok...I should get an extra point! LOVE all her stuff.....kinda bumbed to see another car seat cover....I like that one way better than my Go Go poncho. Darn...I should of thought of that! EmilyHorne is now following Kristin Sellars on Twitter! The best parenting advice I ever got was to let them get dirty! Germs build immunities! love the diaper set and all the felt food- SO cute!! best baby advice: don't get mad, take a picture! I love the bib and burp cloth sets, each and every one of them. Best advise, read to them so they develop a love of reading. Love the blue dot necktie! How cute!! don't raise your voice, more for toddlers! I love all the felt goodies...the mail is so cute! The best baby advice I got was to go with your gut...and put down the books! Every baby is different and the books just make you stress like CRAZY!!! I know some people swear by it, but the worst advice I got was to follow BabyWise...yikes! I could NOT listen to my baby cry! I just visited her blog, left a comment and am now a follower...she has some great ideas!!! LOVE LOVE LOVE the bibs for boys!! So adorable!!!! so funny! i checked out her shop last week when she posted the ribbon tutorial and bookmarked basically the same favorites as you posted here! i am definitely getting my little one the diaper changing set and the pancake breakfast...tuck them away for christmas if i can wait! 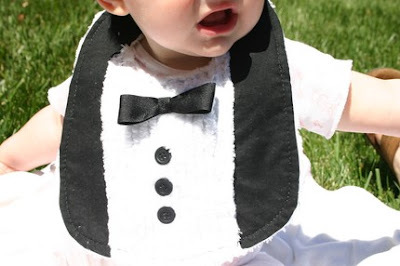 if any of my friends have a little boy soon, i will definitely be getting the tuxedo bib...too adorable! don't feel guilty about letting the nurses take care of the baby at night while you're in the hospital. get some sleep while you can...it will all soon come to an end!!! Enjoy the moments. Enjoy the smells. Don't get so caught up in being the perfect wife, mom and everything else that you lose focus on just having fun and enjoying your children!! I love the felt mail set and the tuxedo bib. Give your child whiskey for teething! and Give your child Benadryl if you want them to be calm on a flight or you just need some sleep! oh, and how about the pediatrician telling you to wake the baby up every 2-3 hours to feed. have they ever had newborns before? they must be smoking crack to give advice like that! they will wake up when they are hungry, duh! I instantly fell in love with the breakfast, eggs n' bacon set. Too cute! Worst advice: don't get an epidural - it will make your labor take forever. Happy to say that was not the case for me and I am 100% pro-drugs. God bless! just left her some comment love! I love the pink and green tutu bow holder. It would go perfect in my daughters room. I love the felt mail! So cute. Best baby advice - just relax. Worst advice - you shouldn't hold him so much 'cause then he'll get spoiled. I fell in love with the diaper set already when I saw it on her blog and am thinking are my big girls already to old for it? lol. Can we still get one? I love the baby doll diaper changing set! I LOVE the diaper set! If I don't win one I am going to have to order one for Mad for Christmas!!! I already follow Lu Bird Baby blog! She has a great shop and a wonderful blog! hmmm best baby advice....this is a hard one! Probably just believe in yourself! I was a first time mom and living on the opposite side of the country from all my friends and family at the time (darn Navy! haha) I was nervous but I think we did a great job with Mad! Worst advice: for us was the 'benefits' of co-sleeping. AHHH Sometimes I don't like sharing my bed with my husband let alone a squirming, blanket stealing, wide-awake at midnight kid! Co-sleeping was definitely not for us! My girls would love the Diaper set. Also, the breakfast set is sooo cute. The first 12 weeks are the hardest. When the baby turns 3 months old, it is like a magic switch gets turned on and they are totally different. I really can't remember any that stick out but my friend recently got some bad advice. Someone told her that she was holding her newborn too much. I instantly thought really??? Newborns need all the loving they can get. My daughter would go crazy over the diaper set! I love love love her mail set - so much I made my son one! But at her shop - since I have a little boy, my favorite is the teal and orange tie shirt. Too cute! The best advice I've ever been given is to always hug and hold when they want to be held and hugged. They will grow up and not want you to do it anymore so make the most of when they do. The worst advice I ever recieved was that since my son was adopted that I needed to let a stranger breast feed my child otherwise he would be sickly all of his live! I left some comment love for her and am now following her on twitter! It's hard to say which of her items I like the most - what a cute shop! I love the felt food & the doll diapers and the tutu flower/bow holder! I added her to my etsy favs! oh my goodness how to choose. I have two kids that would L-O-V-E the mail AND the food. What original ideas! Worst advice: I can't remember - I was 31 when we finally were chosen to adopt and by then I had my own ideas about raising children. I love her baby doll diaper sets! I just had a baby boy and that tux bib is so in our future! My favorite item on Kristin's website is the brown and white polka dot car seat cover. Love it! Oh man../i could go hog wild at that etsy shop!! The mail I think is so creative and clever!! I visited her blog as well...could I find time with 3 kids to do things like that?? The worst advice I received was that newborns sleep 20 out of 24 hours. Yay right, I learned REALLY fast that ain't so -when it came to my 3 kids who never slept the whole night through even until today. I like the necktie bib with the blue striped tie - also the tuxedo bib! I visited Lu Bird baby's blog and left a comment there. I love the baby changing set. My daughter would love it! Best baby advice: Leave very soft music playing in the baby's room as he sleeps. If baby wakes up - and doesn't need to get up - the music will be familiar and lull him back to sleep. One of my friends gave me a print with the following poem, which turns out to be some of the best advice I've been given. The worst advice I was given was to rub whiskey on my teething baby's gums (apparently that advice is still being given), which I didn't do. I'm already a follower of her blog and left her a comment. Thanks so much for the giveaway! I LOVE the felt breakfast!!! ANd the felt letters/mail is so smart! The best advice I got was to talk to your baby when you nurse and to really remember that quiet time between the two of you! The best advice I received was to rest when the baby did. I didn't follow that advice as much as I should have. The worst advice I received was from my mother-in-law, who yelled at me to "Put that baby down!! She doesn't even realize she's been born!!" LOL. I loved holding and snuggling my babies. How can they get too much?? Erin Wilhelmsen The best baby advice I ever received was to put a colicky baby face down on my lap, gently bounce my knees and pat the baby on the back. Erin Wilhelmsen the worst one is one my mom got which was to cover the babies feet in vaseline when they start to get sick. What? Erin Wilhelmsen I love the felt food and little diapers. I keep wavering back and forth on whether or not I am up to making felt food. I love the sweet diaper set. My daughter would love this for her babies. I also think the tux bib is adorable. She very talented! Some bad advice: put rice cereal in their bottle at 4 weeks to sleep through the night... I don't need sleep that bad!! Good advice: treasure each day... have to remind myself of this sometimes, but it really is so true. You will realize with your 2nd just how fast it really goes! Good advice; Take time for yourself! You can be a better mama that way! Bad advice; put a TV in your kids room! my absolute favorite thing is the felt mail. i've been "eyeing" that set for a while now. it would be a wonderful addition to my preschool class. BEST ADVICE ~ just b/c you ask someone for advice doesn't mean you have to actually take it. you have to do what works for you. WORST ADVICE ~ if you hold your baby too much, you'll spoil him. whatever! i'm following kristin on twitter! My favorite product is the felt mail. Love it! Sleep when the baby sleeps, and work toward getting baby on a sleep schedule. Just keep popping that pacifier in his mouth...he'll figure it out. (Which turned into MONTHS of getting up in the middle of the night to pop the pacifier back in!) :) Thumbs are our preference now, for sure! I LOVE the mail set! worst (after commenting out loud about by my post-baby body): "Don't even worry about the baby weight....it will just melt off since you're nursing"....um.....hello? melt? are you kidding me? does this actually even happen for anyone? I am insanely jealous of you if it does!! best: don't make the house perfectly and totally quiet when the baby sleeps, or that's the way they will need it to be every time b/c they will get so used to it! Oh. No joke... I love the felt mail set! people can look at family and learn what it looks like to love like Christ, and forgive like Christ. Because, suddenly all so visible in the line at the grocery or at dinner is: grace, faithfulness and the story of the gospel (or the lack of it). And, when we mess up, Christ is made known even more in our weaknesses (woooo!). Grace, forgiveness, honest and intimacy-- Christ has brought by healing our hearts. I think it's the coolest thing ever. and... the worst baby advice I've ever heard is to keep the house super duper quiet during naptimes. I love the car seat tent- and her blog is fabulous too. I adore the tuxedo bib...perfect for the little guy showing up in September! Thanks for a great giveaway! Too many cute things to pick from! I love the tutu creamsicle bow holder the best. My favorite shop item is by far the doll diaper sets. My daughter would have so much fun with that. She loves playing "mommy". I love the car seat covers! What a great idea. I'm considering buying one that matches our car seat. My little one is 3 weeks old and people get way too close to him without asking if it's ok. The best advice I have received is to swaddle my little Colton with his arms down to help him sleep better. It keeps him from bopping himself in the face at night. The worst advice I have received was to give my baby sugar water. For what, I don't know? Why would my newborn need to eat sugar?? ?